The manual is divided into five chapters: general matters, timber, concrete, masonry and steel. 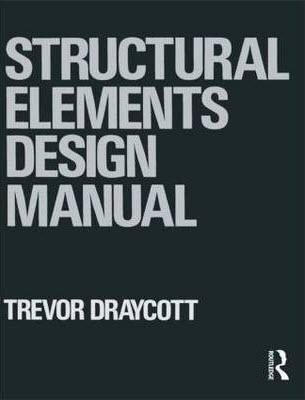 Each chapter provides practical guidance on the design of structural elements in accordance with ihe appropriate British Standard or Code of Practice. However, this manual is not intended to be an exhaustive explanation of the various design codes - although some readers may find it a useful introduction to those codes.Gives clear explanations of the logical design sequence for structural elements. The Structural Engineer says: `The book explains, in simple terms, and with many examples, Code of Practice methods for sizing structural sections in timber, concrete,masonry and steel. It is the combination into one book of section sizing methods in each of these materials that makes this text so useful....Students will find this an essential support text to the Codes of Practice in their study of element sizing'. have been fortunate during thirty years in structural engineering to have received help and guidance, both directly and indirectly, from people too numerous to mention here. This manual is therefore intended, in some small way, to redress the balance by offering assistance to anyone wishing to learn the principles of structural element design. I hope that it will be a source to turn to for help as a student and a friend for reference when one has gained experience and confidence. In conclusion, I must acknowledge the invaluable assistance received from certain people in particular. I am indebted to Francis Myerscough for the thorough way he read through the draft and for his pertinent comments. Special thanks are due to Sue Dean who somehow managed to decipher the scribble and turn it into a typed manuscript. Last, but certainly not least, I am grateful to my wife and family for their patience and support during the months of writing.